It was a lively day after better-than-expected Union Budget proposals. Sentiments remained upbeat all throughout the day, with the Sensex marching upwards and surpassing the 18000 mark whereas the Nifty crossed 5500 levels. Value buying in beaten down stocks led the markets to rally. Major support came from auto, banking, realty, capital goods and metal stocks coupled with positive global cues. Good monthly auto sales and strong economic reports also boosted sentiments. In the Midcap space, Stride Arcolab, United Breweries, Glenmark Pharma, GMDC and Gujarat Gas were up 7-16% while Kirloskar Brothers, Rei Agro and KGN Industries fell 2-4%. In the Smallcap space, KRBL, Shasun Pharma, Force Motors and Hinduja Foundries gained 11-20% whereas Surana Inds, EIH Associated Hotel, Parenteral Drug, Urja Global and Hinduja Venture lost 4-9%. Healthy global cues led the Sensex to start the session 159 points higher at 17982 and soon hit the day?s low of 17964. Later the Sensex climbed higher, extending gains as the session progressed. The Sensex did not look back and continued its northward journey in the afternoon session, hitting the day?s high of 18479 in late trade as strong value buying was seen across the board. 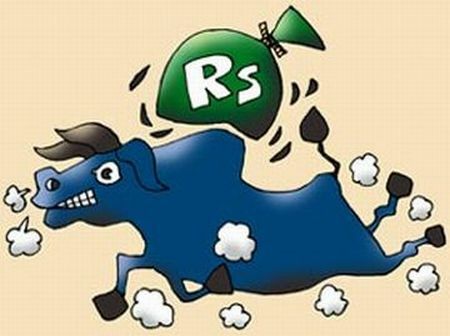 The Sensex closed at 18447, higher by 623 points and the Nifty shut at 5522, up by 189 points. The market breadth stood extremely strong as rising shares outdid the declining ones almost three times. Of the 2,968 stocks on the BSE, 2,128 rose while 759 declined. Whereas, 81 stocks closed unchanged. Wind turbine major - Suzlon Energy was traded the most, with over 0.76 crore shares changing hands on the BSE. Following by India's second largest developer - Unitech (0.57 crore shares), India's Number 2 mobile carrier - Reliance Communications (0.57 crore shares), industrial finance company - IFCI (0.46 crore shares) and Jaypee Group firm - Jaiprakash Associates (0.38 crore shares). All the sectoral indices closed on a buoyant note. BSE Auto was the biggest gainer of the day rising by 5.64%. Following that BSE Bankex up by 4.35%, BSE Realty rose by 4.20%, BSE Capital Goods (CG) gained by 4.19% and BSE Metal up 4.13%. Rest of the indices ended higher in the range of 1.71-3.11%. Going into 'A' group stocks, Glenmark Pharmaceuticals was the top performer surging by 14.10%, followed by Ashok Leyland up by 11.46% and TVS Motor advanced by 11.03%. Among losers, Adani Power slid the most by 1.85%, followed by EIH down by 1.30% and National Aluminum fell by 1.01%. European shares rose on Tuesday, starting the month on a stronger footing, with sentiment boosted by optimism over the outlook for the US economy. All the major Asian indices ended on positive note on Tuesday. Kospi index was closed today. The US stock index futures point to a higher opening on the Wall Street on Tuesday.